Environmentally friendly, this quiet, durable, and hefty lawn mower cuts through the toughest grass with ease. This 12 amp electric motor delivers enough power to cut through any job. The durable steel 20-inch cutting deck cuts more with ease, efficiency, and smoothly. This mower has a 3-in-1 feature that provides multiple options for grass clipping removal. You can collect grass in the rear bagging compartment, side discharge it or choose to mulch if needed. This mower has the capability to match your needs with versatility. The 7 position height adjustment offers a range of cutting heights from 1 1/2-inches to 3 3/4 inches for the perfect cut for any grass type. The wide 10-inch rear wheels and 7-inch front wheels allow for easy handling of this 56-pound machine. 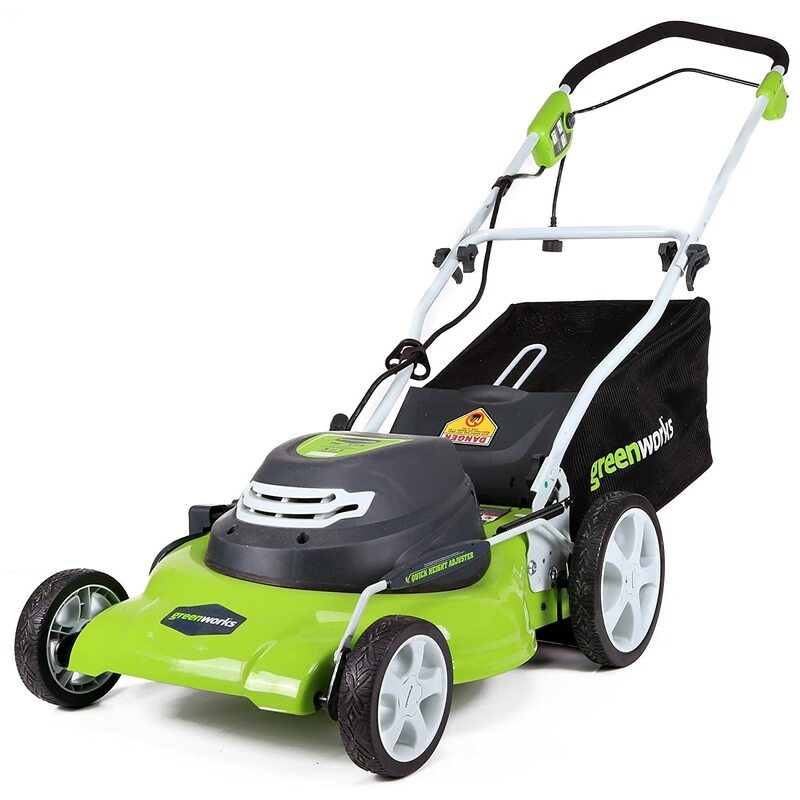 The GreenWorks 25022 12 amp corded 20-inch lawn mower is made of metal meaning a thinner build with stronger durability. The 20-inch deck allows for you to mow your lawn faster with fewer passes, but delivers a closer cut to stationary objects due to the smaller shroud over the blade providing for faster time management of your yard maintenance. The larger rear tires make this mower a top pick for maneuverability and ease of use. Cord management is also not a problem thanks to the pig-tailed cord that secures nicely to the mower after clean up is complete. Overall, this mower is a great pick for long-term care of your lawn. 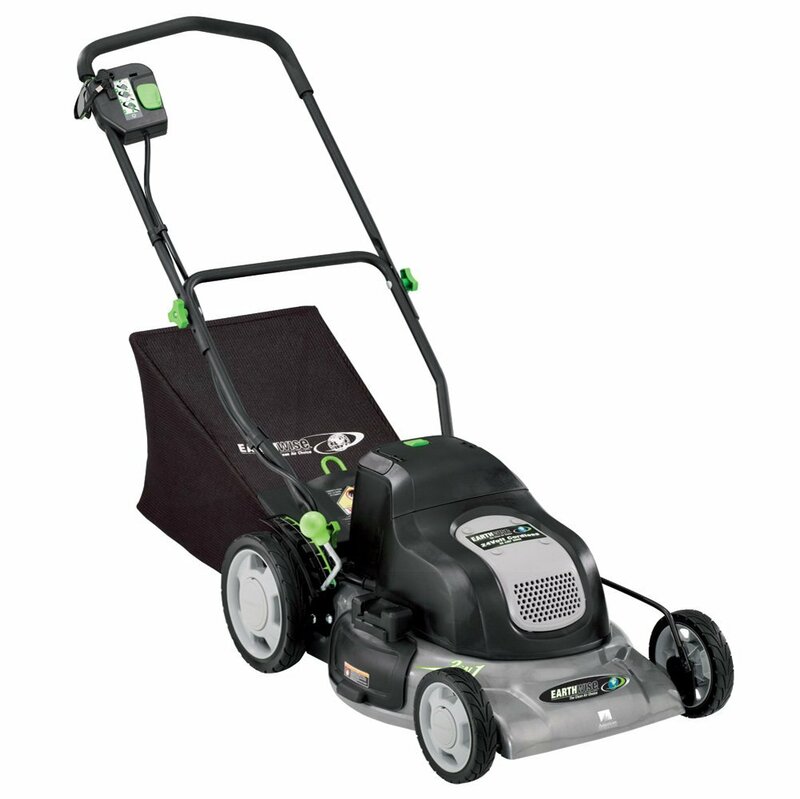 The convenient bagging features of this model make for easy clean up with leaves while mowing. The simple to remove mulching plug adjustment allows for a quick and easy switch. Just lift the spring-loaded back door, remove the plug, and the bag hooks securely to the mower with 2 hooks. When you are finished collecting grass and leaves, the standard bag has a nice rounded design that allows you to pick the bag straight up without bending over and pulling it back allowing for less spilling of clippings and for a better emptying experience. This design feature is one that has been well thought that makes this mower the top-rated pick. When searching for a lawnmower, it’s hard to find one that has a well thought out design and gets the job done efficiently, but the GreenWorks 25022 12 Amp Corded 20-Inch Lawn Mower is hard to overlook. The steel cutting deck makes getting a close cut easy, the rounded bagging design makes grass removal a breeze, and the versatile 7 height adjustment features make this mower a top of the line pick with no hesitation. Overall, you can’t beat the quality and ease of use from this mower. GreenWorks has definitely created a product that outranks their competitors by leaps and bounds. This simple to use lawn mower comes in as another great alternative as a best corded electrical powered mower with a 12 amp motor that allows for easy mulching and bagging. It is also effortless to start, and just as easy to maintain. It also provides no fumes or emissions, so it is another great choice for an environmentally friendly lawn care item. It has a 19-inch deck that allows for a quick cut and has a cushioned grip and handle that allows for easy height adjustments. It weighs 52 pounds so it’s another lightweight option for an electrically powered lawn mower. It does come with a two-year limited warranty and includes a rear bag assembly and rear mulching inserts included. 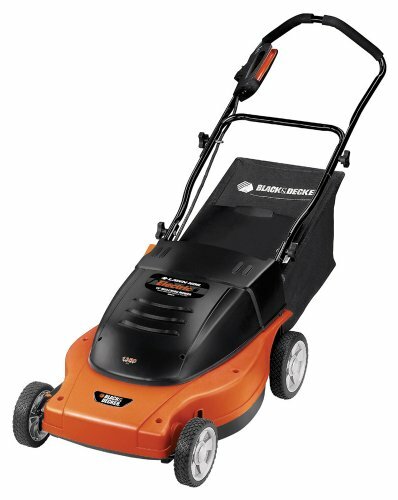 Black and Decker is a long-time trusted company that makes quality products that last, so if you are looking for a great product for your lawn, the Black and Decker MM875 Lawn Hog is a great alternative. 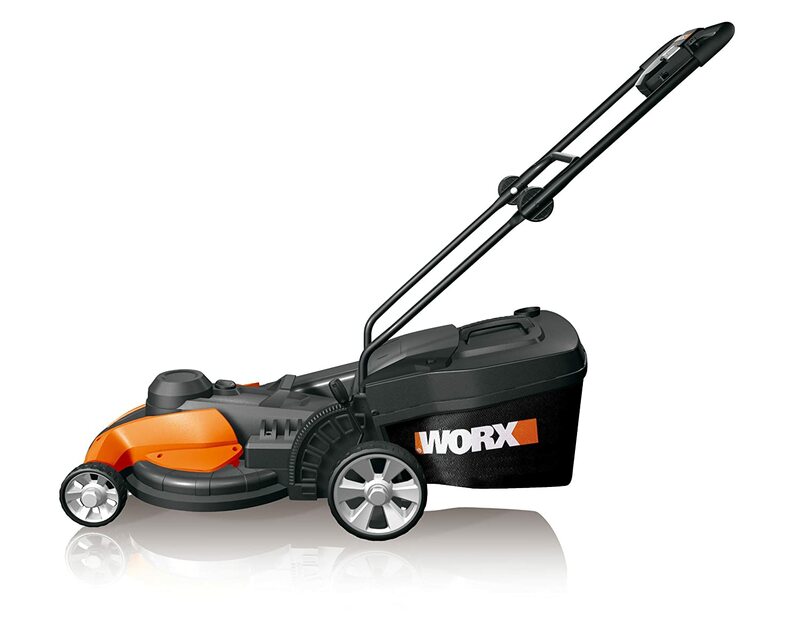 The WORX WG708 is a great choice because it boasts 3 functions in one: Blade-cutting, mulching and grass collection with quick and easy grass bag release that features a carry handle. The grass collection bag also has a rigid plastic top that has a full indicator so you know when to dump it. With the grass bag capacity being 1.4 bushels, it holds a fair amount. The six positions tool-free lever provides convenient and central height adjustment that is quick and easy. For virtually being a smaller mower, it pulls its weight against its competitors and should heavily be considered as a great option. The Earthwise Cordless Electric Lawn Mower, Model 60120 gets this review based on the features for its pricing. It has a single lever height control option with an easy on and off the mulching plug, grass catcher, and discharge chute. It comes with a handle mounted safety blade control and safety key. The comfort “V” handle is equipped with a cushion grip and has a soft touch operation. It also comes with the battery and charger. It seems to have the best bang for its buck, so this will be a great economical choice for anyone who wants a less expensive choice.